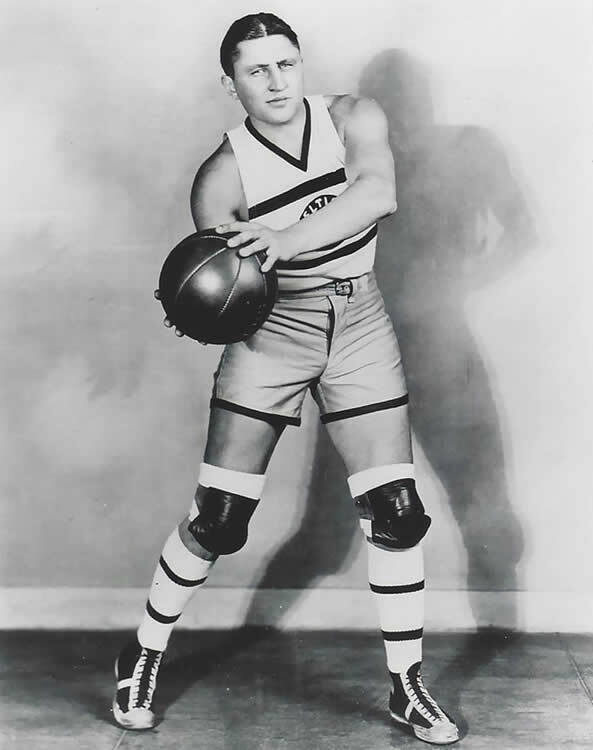 Henry “Dutch’ Dehnert did not play basketball in either high school or college. He began playing professionally at age 19. Dehnert was never flashy or a top scorer, but even as a youngster he possessed an amazing intuitiveness for the game. Dehnert attracted attention to his special skills as key performer on two consecutive Pennsylvania State Basketball League championship teams, with Nanticoke in 1919-20 and with Scranton the following season. Like all players of the era, Dehnert led a nomadic existence for his first five seasons before he signed was signed to an exclusive contract by Original Celtics’ owner Jim Furey in 1922. Dehnert became an instrumental figure on the Celtics’ teams that dominated basketball for most of the decade. Dehnert looked bulky and even a bit awkward in appearance, but in reality was surprisingly agile and a skilled ball handler. His playing style was deceptively calm and he remained outwardly cool under pressure. On offense, he crouched in the pivot with his back to the basket, effectively directing the team’s plays. Never a good shooter, Dehnert scored most of his points from directly under the basket. He excelled as a rebounder and passer and as the acknowledged best defender in the game, always guarded the opponent’s best scorer. Dehnert’s career with the Celtics covered the glory years in the 1920’s all the way through the draining Depression-era barnstorming of the 1930’s. Dehnert turned to coaching in the 1940s with some success. As coach of the Detroit Eagles, he won the 1941 World Professional Tournament. He also won two National League division titles (1944-45 and 1945-46) as coach of Sheboygan. In 1946-47, Dehnert was hired to coach the Cleveland Rebels in the newly formed Basketball Association of America, but was fired at mid-season. Dehnert was elected to the Basketball Hall of Fame in 1969.